The knee region comprises the distal femur, proximal tibia, proximal fibula, and patella; the knee joint is continuous with two major articulations, the femorotibial and patellofemoral. The distal femur and proximal tibia develop from the epiphyseal cartilage at the end of each bone that includes the joint surface articular cartilage, the physes (epiphyseal growth plates), and the intervening epiphyseal cartilage where the secondary ossification centers develop beginning in the late fetal period. Other structures include anterior and posterior cruciate ligaments, medial and lateral menisci, meniscofemoral ligaments of Wrisberg and Humphrey (posterior and anterior, respectively, to the posterior cruciate ligament), meniscotibial attachments/ligaments (coronary ligaments), synovial lining and joint capsule, medial and lateral collateral ligaments, surrounding muscles, and adjacent nerves and blood vessels. 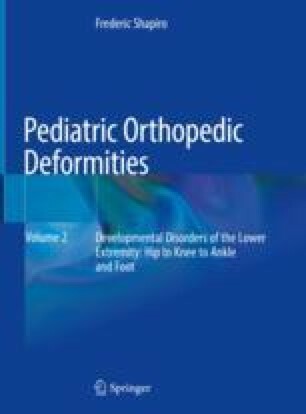 Each of these structures can be the site of primary developmental deformity or be involved with secondary deformity where adjacent primary deformity persists as growth continues.